A sign on the door to the courtyard gives warning of the construction to come. This spring marks a turning point in a long road of construction for Big Sky: at last there are going to be physical changes made to the school. There are a vast number of improvements to be made. With so much in the works, many may wonder what exactly is going to happen in the immediate future. One thing that is set in stone is the new auditorium, this was actually written into the bond passed by voters in 2018 so Big Sky is required by law to have it done. To kick off the start of construction, the original drama room has become Jackson Construction’s Big Sky “headquarters” so to speak. They essentially put a large hole in the wall through to the parking lot behind the school, which is closed off to parking, this gives them easier access into the school. This meant the moving of drama teacher Sarah DeGrandpre from room 72 to room 92, which will most likely remain DeGrandpre’s room through next school year. The lockers on the wall outside of the old drama room are being removed and there is the possibility of that wall becoming a “storefront,” in other words it will be entirely made of glass. The old drama room will become a new Industrial Arts classroom once Jackson Construction no longer needs it, so this storefront will allow students to view the work going on in those classes. There will be entrances in the new 60s hallway. Since it isn’t year known how many lockers there will be room for, all of the students with a locker in that hallway have had to clears theirs out for reassignment. Over spring break an asbestos agency came into Big Sky to do some asbestos abatement in the cafeteria, which is the controlling and removal of asbestos. The asbestos was in the floor tiles, which is why they were removed completely. The flooring in the cafeteria will be cement until the bulk of the construction is done. The last big change for this school year is the demo of the courtyard. Crews are taking out the cement and everything else in the courtyard, including the large eagle statue. 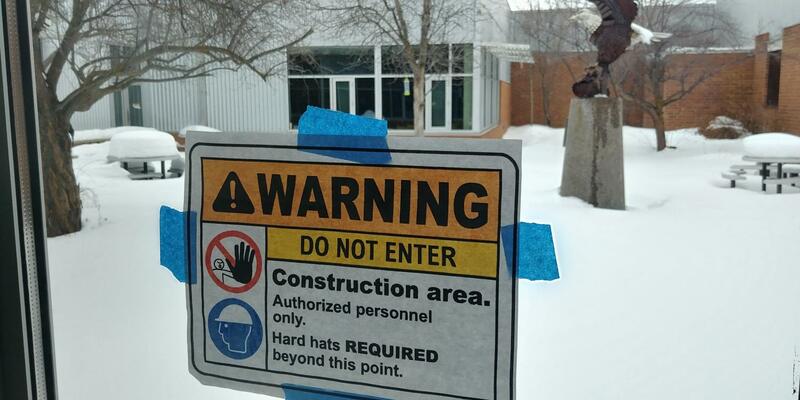 It is likely that the statue will be moved to sit out in front of the main entrance. Although this is all you’ll see this school year, the majority of the work will occur over the summer. The construction is scheduled to last through next year and into the summer of 2020 it is supposed to be done that September, so be prepared for the big changes ahead. All construction staff have undergone security checks and will be required to wear ID badges. Jackson Construction also will keep crews and students separated, these are all safety precautions put in place for the well being of students and staff at Big Sky. It is nearly impossible to lay out every detail of what is expected to happen, because details will change as the project progresses, which is why Principal Jennifer Courtney has opted explain the project in chunks rather than attempt to explain everything to staff at once. Doing this allows her to be more accurate since details can, and will, change in a project as large as this one.